MT Z1 is a clean, creative and responsive Magento template that includes a good number of features. What makes this template so unique is its power to adapt to all screen size. It means that your website will look great whatever it is being viewed in Desktop, Mobile or Tablet. Based on a very popular framework from Zooextension, this simple responsive Magento theme owns an easy to use admin panel with unlimited selection of color, dozens of theme elements, hundreds of amazing fonts and plenty of useful features which impress visitors, both visually and conveniently, such as: the big Revolution Slider, Advertising Banner, Drop-down Mega menu, over ten widgets, and over 20 nice static blocks. All make building your website easy in minutes! If had to use only one word to describe this responsive Magento theme, it would be “impressive” because of design and its built-in features. So right now, Say Hello to MT Z1 and take your store to next level with this great responsive Magento theme. This theme is perfect for online flower store with eCommerce functions of Magento. Built-in 4 different store style: Car accessories, Fashion, Kids, Food & recipes. 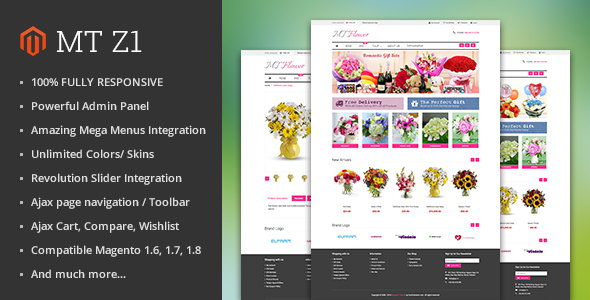 Item Reviewed: Responsive Magento Theme for Online Flower or Gift Store 9 out of 10 based on 10 ratings. 9 user reviews.